Navigation system address: Lambarenestraat, Delft. Go to the end of that street. Once you are parked, take the Sowetopad cycle path (the prolongation of the Lambarenestraat) to the left, then turn right on the Buurtlooppad, which crosses a bridge and takes you into the Eendenkooi proper. Turn left to start your walk following the water. I mark on the map (with a blue line) what we have walked ourselves, as I cannot seem to be able to find a map showing the exact domain covered by the Eendenkooi. Most of the area seems to be on-leash only, but it barely ever gets checked, according to the locals. One path is offleash: The Tanthofkade. 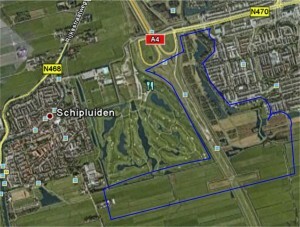 It runs along the Windhoekstraat (number 1 on the map). Also, bikes are not allowed on that path, as an added bonus! One whole area is dedicated to horsemen, and dogs are not allowed there at all. This is clearly sign-posted. It has some relatively unspoilt polder landscapes (‘unspoilt’ and ‘polder’ are a bit of a contradiction, as it doesn’t get more man-made than a polder, but hey). I find this landscape stunning, personally. 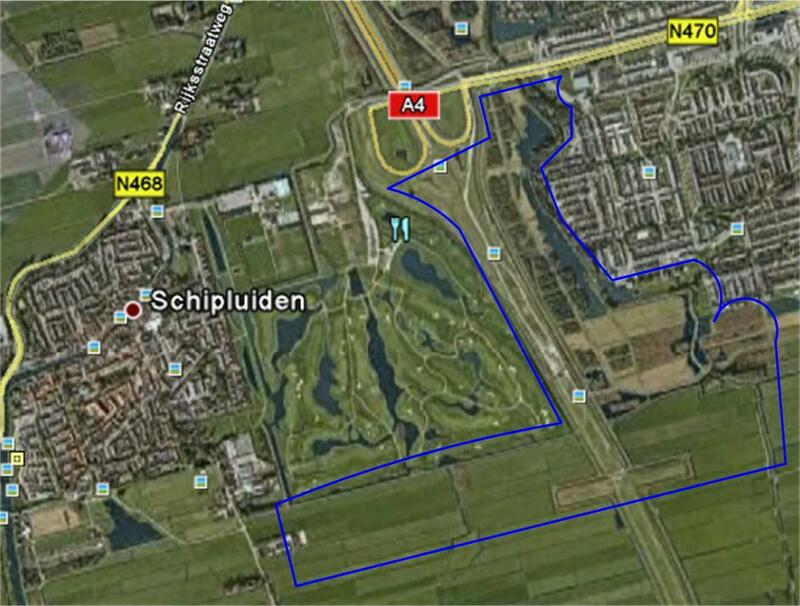 Lovely views on the Rijswijk golf club’s neat hills and neat landscaping. In places, the water in the river is actually reasonably clear. You can see for miles and miles of agricultural land, meadows and a distant cityscape far away on the horizon. Lots of clearings along the river banks. Ideal for a family picnic. Pedestrians, dog walkers, horsemen and race cyclists do not make good bed fellows on the asphalt path they are meant to share. The pathways can get quite busy, really.